LINCOLN, Neb. — Agricultural land markets in Nebraska remained relatively steady in the last year, according to preliminary findings from the University of Nebraska-Lincoln. 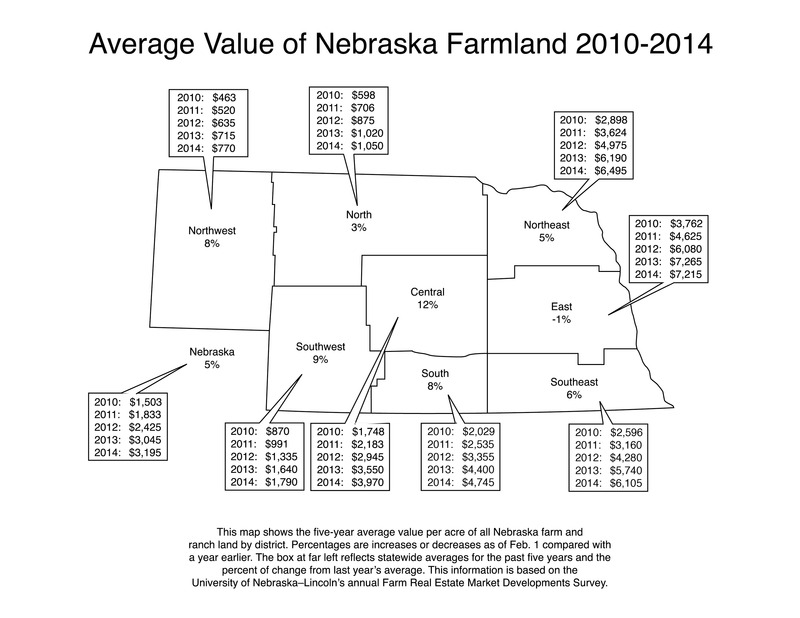 Overall, the average statewide farmland value rose by about 5 percent, as of Feb. 1, to $3,195 per acre, said Jim Jansen, research analyst with UNL's Department of Agricultural Economics, which conducts the Nebraska Farm Real Estate Market Developments survey annually. Survey reporters across the state reported percentage gains for all the farmland classes for the period from Feb. 1, 2013 to Feb. 1, 2014. Current figures are preliminary; a final report will be available this summer. Farmland values in recent years have increased sharply. The overall increase of 25 percent in 2013 followed increases of 22 and 32 percent in the two previous years, leaving the 2013 all-land value more than double the value in early 2010. In the last year, the largest increase by land class occurred for non-tillable grazing land, at 7 percent. Non-tillable grazing land includes pasture and rangeland that does not have the current potential to be converted into cropland for small grain or row crop production. Record high livestock prices translated into strong increases seen throughout the state for pasture and rangeland. The increases in non-tillable grazing land varied greatly among the districts, with a low of 4 percent reported in the Northwest District to a high of 32 percent in the South District, but the Northeast, Central, East and Southeast districts all averaged around 15 percent. Expectations among survey participants also indicated high future cattle prices to be a strong factor fueling the increase in non-tillable grazing land. Increases in dryland cropland values also varied across the state depending upon the location and potential for irrigation. Generally, changes of less than 10 percent occurred in the eastern third of Nebraska for dryland cropland with or without irrigation potential. The Eastern District had a decline of 5 percent in the value of dryland cropland with no irrigation potential, but this should be noted as more of a negligible change given the strong increase in this district over the prior several years, Jansen said. The western two-thirds of the state had the strongest increases in dryland cropland values, with increases averaging around 20 percent. Increases in the value of dryland cropland of the western two-thirds of Nebraska are comparable to those of the eastern third of Nebraska reported by survey participants during the past several years. Trends observed for the value of tillable grazing land are comparable to those of dryland cropland for the western two-thirds and eastern third of Nebraska, Jansen said. The hayland class proves to be a critical component of forage production in the state for cattle producers. Increases in the value of hayland generally averaged around 10 percent across the districts in 2014, whereas in 2013 the increases ranged from 25 to 30 percent, spurred by the devastating effects of the 2012 drought. Future changes in the value of this land class likely will be tied to the value of forages and cattle production in Nebraska. Observed changes in the value of gravity irrigated and center pivot irrigated cropland ranged from 2 percent decreases to almost 20 percent increases. Weighting these ranges across the districts equated to an overall increase of about 4 percent for each of the two irrigation land classes. For the prior two survey years in 2012 and 2013 the land value averages had an annual increase of about 30 percent. The smaller increases in the value of irrigated cropland in 2014 suggests the market is holding steady given current expectations and commodity prices. Surveyed 2014 cash rental rates for cropland on average declined with lower commodity prices while pasture and cow-calf pair rental rates significantly increased due to higher beef cattle prices, the lingering effects of the drought, and the conversion of some marginal land to crop production. Lower anticipated grain prices in 2014 have led to lower average cash rental rates for dryland, gravity irrigated, and center pivot irrigated cropland as profit margins begin to tighten, Jansen said. The preliminary report can be found at agecon.unl.edu/cornhuskereconomics.